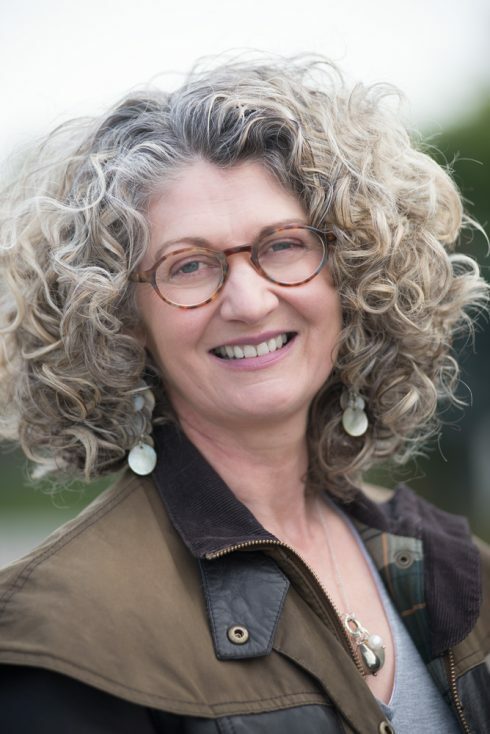 Carolyn Scott-Jeffs is a writer, a theatre director and dramaturg. She is also an academic, lecturing at Loughborough. Her interests are the history of radio drama, and in particular the women who wrote for early radio (can you tell already that this might be a bit of a love fest coming up?). If that isn’t enough, she is also the writer of a the latest play my daughter in law is appearing in at the Lichfield Garrick, about a largely unsung, very interesting and powerful woman, called Anna Seward. It’s called Letters to Emma. And that’s how I came to be talking to the fascinating and talented Carolyn Scott-Jeffs. Jane: Carolyn, thank you so much for taking time out of rehearsals to talk with us. First night is not very far away, I know, so it’s doubly appreciated. Can we start with the play Letters to Emma? How did the idea for this come to you? Was it a commission piece, or have you always been aware of Anna Seward? Carolyn: The play was commissioned by Lichfield Garrick with the support of Arts Council England as part of the celebrations for David Garrick’s 300th birthday. Anna Seward was a poet, who also wrote many letters that were published after her death by Sir Walter Scott. She was part of the late 18th-century Lichfield literary circle that included Garrick, Samuel Johnson, and Erasmus Darwin. She corresponded with all of them. Anna was remarkable for the time because she was highly educated. Tim Ford, the artistic director at Lichfield Garrick, suggested she would be a good subject, so I did some research and realized that she was quite extraordinary. The idea for the play came out of my research. When she was young she had an imaginary friend who she wrote to so that she could give herself advice. I realized there was a parallel between what Anna was doing and the way young women create their personas on social media today. Letters to Emma envisages Anna’s imaginary friend as a student in 2017, and the internet is like another character in this two-hander. Tim and his team of creatives and technicians have made cyberspace in the Garrick Studio. It’s been an amazing process. Can we go back a bit in time ourselves? I’d love to know a little more about your background and how you ended up where you are today. Has writing always been a passion of yours? Were you a gifted child writer, entertaining your siblings, family and friends with dramatic readings? Was your early writing encouraged at school? Well – I’m from the Black Country, so the answer to most of your questions is, ‘not really… but sort of.’ I lived in West Bromwich from the age of 6 and attended local primary and secondary schools. I was a bit different to most of my classmates I think because I liked reading books. My mother took me to the theatre occasionally because she liked going, so I knew what theatre was, but it certainly never occurred to me I might be a part of that world. I’m an only child and my mother ran a community riding school in the heart of the Sandwell Valley. There were two 20-story tower blocks 100 yards behind the stables, and the M6/M5 interchange flyovers went right over the top of our house. It was certainly an unpromising start for a career in the arts. I always wrote. I wrote my first novel when I was 13 and read it to my friends. They loved it because they were all in it. I’ve still got it. I didn’t like school much. A Black Country comprehensive was a tough place to be in the 1970s and early 80s. I preferred riding horses. When I did my A levels I didn’t really go to many classes, I just read the books and turned up for the exams. I did like English though, and my teachers tried very hard with me on the whole. They let me put on the house plays and I was in the school plays too. This is a slightly contentious question (are men ever asked this and why not?) but one my readers and I are always interested in. You have a demanding and successful career; how easy do you find it to blend the personal and professional? Do you have any tips you can share with us? I don’t find it that hard to blend my personal and professional life these days because I have so much support from my wonderful husband, Anthony. We met on the internet in 2009, and have been married almost 5 years now. Things were much more difficult when I first changed my career because my family didn’t think it was a very good idea at the time. But I’d urge other women to pursue what they really want to do and not feel guilty about it. Be prepared to compromise on the domestic front, and take all the help you can get. You can’t control everything, so don’t try. It’s fine to eat ready-meals and employ cleaners if you can afford it. If you’ve got children encourage them to be independent, and to take responsibility for themselves. Let them contribute to the running of the home and get themselves from A to B. Don’t try to be superwoman. And laugh. A sense of humour will save your life. As I mentioned previously, my daughter in law, Heather Westwell is in the show, which is how we met. (Thanks, Heather!) You also have a family member in it, your daughter Lizzie. Lizzie, I know, is an accomplished actor in her own right, and has a lot of experience despite her young years. How is it working with your daughter? Do you have work personas and home personas? Has working with her raised any eyebrows? Heather is a fantastic actor. This is a really joyful creative process for me. I love working with Lizzie. She’s a complete inspiration. If we were bakers or car mechanics no one would bat an eye at us working together. We work as a writing team on some projects, but usually I write a first draft and she gets involved once I begin to develop the work. With musicals I do book and lyrics, then Lizzie works with the composer, Peter John Dodsworth, on the music. Working with Lizzie has given me access to an extraordinary performer. It is very much an equal partnership and we each have absolute respect for the other’s ideas. But we’re not afraid to disagree, and there are never any egos in the room when we’re working. It’s just about making the work. We’re pretty much the same at home as we are at work. Lizzie moved to London when she was 18, and she is completely independent, so we’re just like very good friends really. Most people don’t realize we’re mother and daughter unless we tell them. It’s a soap box issue of mine, the lack of female voices in the media. I am an avid radio listener and sometimes I just have to switch off BBC Radio 4 Extra plays because of the patronising, sexist attitudes to women, and lack of them as actors. You have a particular interest in women in early radio. How was it for them compared with now? Do you think we have travelled a long road and are we there yet? I’ve written a lot for radio, and I certainly can’t disagree with your views on the majority of the output of Radio 4. It was this view that led me to research the work of women in the earliest days of radio broadcasting. Hilda Matheson and Mabel Constanduros were involved right at the beginning, in the 1920s, when everything was broadcast live. Matheson was in charge of news and talks, while Constanduros was an actress, a writer, and a wonderful comedian. I’ve got a play about them when I can get it commissioned. I could do your whole interview just on them. But to answer your question, they encountered shocking sexism and were really marginalized by the men they worked with. Matheson got into all kinds of trouble because she went head to head with the men at the top. John Reith hated her, and she was eventually forced to resign. Constanduros was more inclined to tell the men what they wanted to hear, and she was never in charge, so they didn’t have the same reasons to resent her. She had a long career, and was still working as an actress for the BBC when she died. She was able to get on with men where Matheson wasn’t. Things have certainly improved since then on paper, but according to other female friends who work in this industry, and my own experience, we’re a long way from equality. How ‘gender equal’ is it for women in the theatre? Have you experienced any discrimination and if so, how have you dealt with it? Hahaha… have you got all day? Speaking from experience, the discrimination in the theatre is shocking. I’ve just written and directed a verbatim play called Don’t Put Your Daughter on the Stage, which uses interviews conducted by my Loughborough University colleagues Catherine Rees and Dan Sage. They interviewed men and women working in the theatre, and have given us a fascinating insight into the industry. The play was performed at an industry seminar over the summer, and we’re doing it at a number of venues over the next year or so. I won’t bore you with a catalogue of my own experiences, but I’ve certainly never found the answer in hating the men I work with. Do you think there has yet been a golden time for women in the arts? I’m optimistic that we’re heading for it. The more stories that are written about women with female protagonists who are interesting in their own right, and not just there to facilitate men’s stories, the sooner it will happen. What advice would you give to anyone hoping to pursue a career in the Arts? Just get out there and do it. Don’t worry about how much you’re getting paid; just make work, whatever form that takes. You might have to do other jobs as well to earn enough to live on because there is so little funding available, but don’t give up. It comes as a shock when you realize that mid-career is harder than early career and there’s no escalator. It’s about networking and collaborating with people you get on with. It’s really important to be true to yourself. It’s taken me twenty years to get a play on at my local theatre, but it’s been worth the wait. Finally, Carolyn, what are your aspirations for the future? Have you ever had a career plan, or have you reacted to events as they have happened? It’s hard to plan a career in the creative arts because so many things are entirely out of your control. I try to do a mixture of planning and reacting. I realized very early on that writing continuing drama for TV, which is one of the most secure ways to earn a living as a writer in the business, wasn’t for me. I really wanted to tell original stories. So I took a permanent part-time post as an academic, and that has kept the wolf from the door while allowing me to write what I want to write. My Birmingham radio producer retired a few years ago and wasn’t replaced, and I found myself without an outlet for my stories for a while. I decided to finish my PhD and focus on my academic career until I made some new contacts. Being a Doctor opened doors for me as a dramaturg, which in turn gave me connections in theatres again. Theatre has always been my first love. I’m working on several musicals at the moment. It’s a very exciting time, but I really can’t tell where my career will go next. But I kind of like that. Caroline, thank you. It’s been fascinating. Maybe we will talk again about Matheson and Constanduros. Here’s to a great opening night of Letters to Emma! 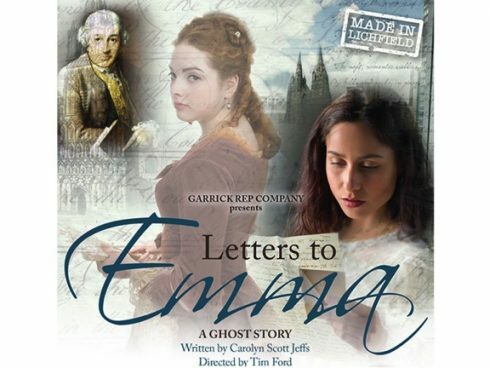 Tickets have been selling well for Letters to Emma but there are still some available, if you’re quick. Here is the link to the Garrick website. If you are anywhere near please do go along. I plan to be there on first night and last night. I’ll be the one tearfully beaming in reflected glory!